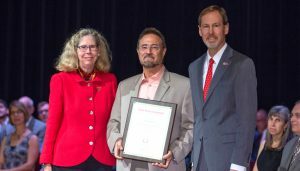 Levitas is shown receiving a plaque commemorating his Anson Marston Distinguished Professorship from Iowa State University president Wendy Wintersteen and Senior Vice President and Provost Jonathan Wickert in the September 2018 university awards ceremony. 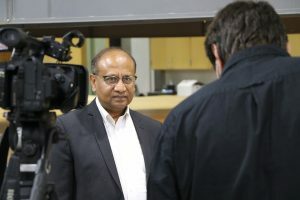 Vance Coffman Faculty Chair Professor of Aerospace Engineering Dr. Valery Levitas has been named Anson Marston Distinguished Professor in Engineering at Iowa State University, one of the highest honors for faculty in the College of Engineering. The title of Anson Marston Distinguished Professor honors exemplary performance in research and/or creative activities as reflected by a national or international reputation in the nominee’s discipline. The awardee retains the title for the remainder of his or her career at Iowa State. Levitas has developed a strong multidisciplinary research program at the intersection of advanced mechanics, physics, material science, chemistry, and applied mathematics and collaborates with the leading researchers over the world in these fields. He is considered a founder of the theoretical high-pressure mechanochemistry. He has had research results published in many of the world’s leading scientific journals, in numerous types of disciplines. He has presented numerous plenary and keynote lectures at various international conferences, as well as numerous invited lectures at various organizations over the world. 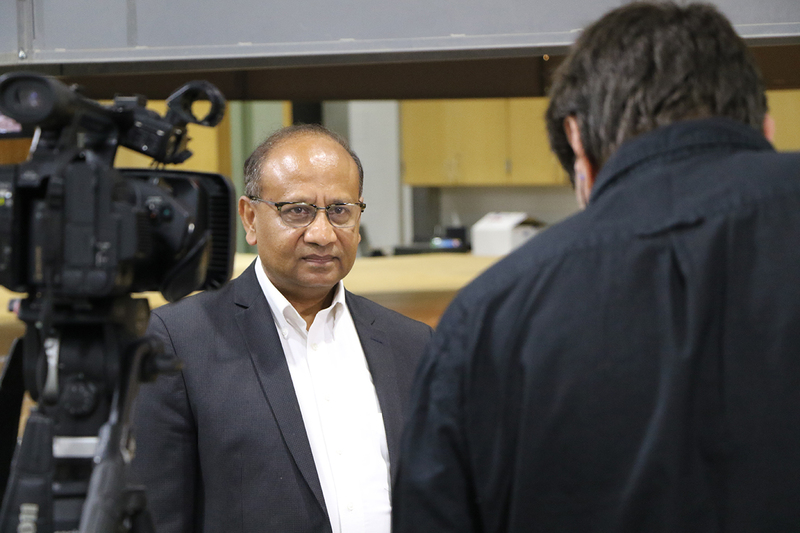 He organized multiple international multidisciplinary symposia on phase transformations and mechanochemistry. Levitas has published more than 390 scientific papers, three books, ten book chapters, 245 referred journal papers and holds 11 patents. 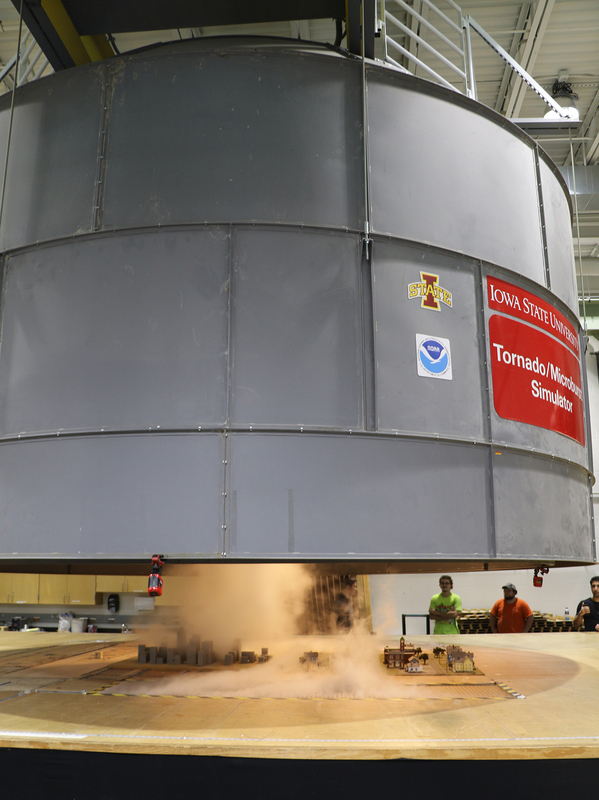 In a story coordinated and published by AccuWeather, the Iowa State facility topped the list. Learn about the honor and the history of the simulator here. 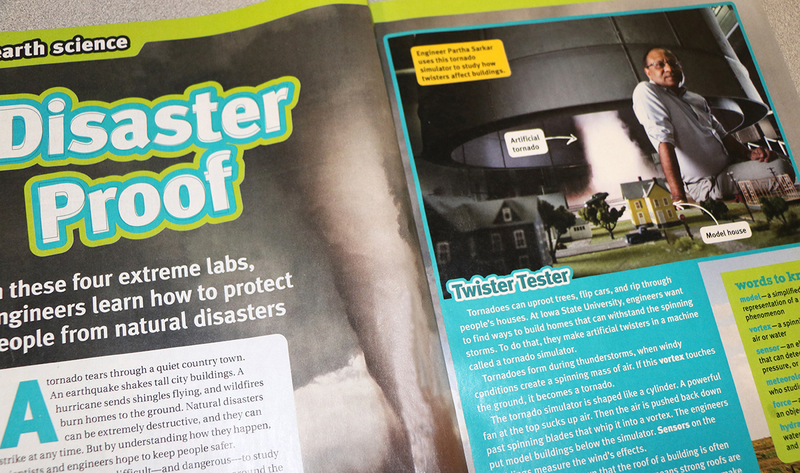 In a story called “Disaster Proof,” discussing engineering laboratories that focus on protecting people from natural disasters, Sarkar and the simulator are included in the school classroom magazine. 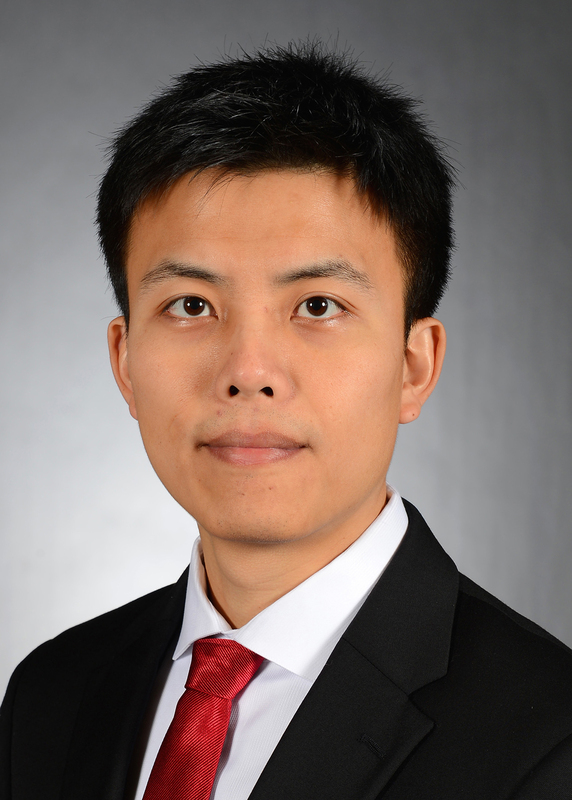 AerE assistant professor Peng Wei has been appointed the associate editor of the AIAA Journal of Aerospace Information Systems. Prof. Wei will join an editorial board that includes faculty members and researchers from MIT, Stanford, University of Michigan, University of Colorado and NASA. The journals is devoted to the dissemination of original archival research papers describing new theoretical developments, novel applications, and case studies regarding advances in aerospace computing, information, and networks and communication systems that address aerospace-specific issues. Topics include aerospace systems and software engineering, verification and validation of embedded systems, uncertainty quantification, the field known as ‘big data,’ data analytics, machine learning, knowledge management for aerospace systems, human-automation interaction, and systems health management for aerospace systems. Applications of autonomous systems, systems engineering principles, and safety and mission assurance are of particular interest. The Journal also features Technical Notes regarding recent innovations or applications. 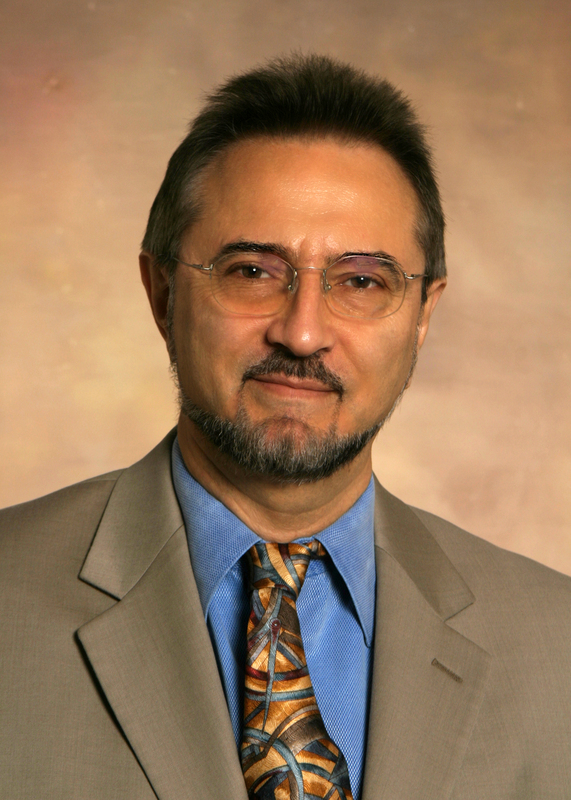 Dr. Valery Levitas, Iowa State’s Vance Coffman Faculty Chair Professor of Aerospace Engineering and of Mechanical Engineering, has been named the 2018 recipient of the Khan International Award for outstanding contributions to the field of plasticity over a period of 24 years (1993-2017), especially for pioneering works on interaction between phase transformations and plasticity in materials under high pressure at multiple scales. This award was presented to Levitas at the 24thInternational Conference on Plasticity, Damage & Fracture, held at San Juan, PR, January 3-9, 2018, where Levitas delivered a 50-minute plenary lecture. The Khan International Award is named after the International Journal of Plasticity Founding Editor-In-Chief Akhtar Khan. The award committee consisted of five former recipients of this Award from the USA, France, Belgium, and South Korea. The selection criteria included general quality, quantity, and standing of research contributions to the field of plasticity and quantitative parameters of citations of all plasticity-related papers, papers published in the International Journal of Plasticity, and papers that have more than 50 citations, excluding self-citations. The Award also includes a mini-symposium on Phase Transformations and Other Structural Changes in Materials, which will be organized in Levitas’ honor at the 25th International Conference on Plasticity, Damage & Fracture in January 2019. A special issue of the journal will include the symposium presentations. 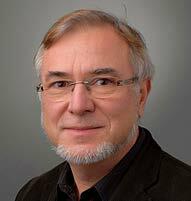 Department of Aerospace Engineering associate professor Norbert Meyendorf has been elected a fellow in SPIE, the international society for optics and phonics. The honor recognizes his achievements in nondestructive testing.